In truth, this is actually two recipes: it yields a fruit syrup that is a stunning Day-Glo red starter for bubbling cold beverages, and also its by-product—my most favorite strawberry jam recipe to date. Absolutely do not discard the macerated fruit left over from making the syrup; when tossed in a food processor or food mill with a squeeze of orange juice, it’s a jam that can be stored fresh in the refrigerator for a few days or canned for later. (The same is true for the other two syrups in this chapter: they give you syrup AND yummy jam.) Note that if you can this syrup, the flavor will indeed become cooked, though it still makes a good soda. In a giant mixing bowl, combine the berries with 2 cups of the sugar, being sure to coat each berry in sugar completely. Cover the top of the berries in a blanket of the remaining 11/2 cups sugar. Let the berries macerate (meaning, sit there and get juicy) for 12 hours, stirring occasionally to help the sugar dissolve. (Setting this up after dinner and stirring periodically before bedtime is sufficient.) The berries will shrink in size and release their juice and the sugar will dissolve in the liquid. If necessary, cover the bowl loosely with a kitchen towel tied with string to protect the sweet syrup from insects. How to Store It: Store, refrigerated, for up to 1 month, or freeze for up to a year. Instructions: Stir 3/4 cup Strawberry Black Pepper Syrup into 11/2 cups sparkling water (or any quantity in a ratio of 1:2). Add ice cubes and enjoy. Shot of gin optional. Or, carbonate it: In a clean glass bottle of any size with a tight-fitting lid, combine syrup and tap water in a ratio of 1:2— for example, a 750 ml bottle can hold a little more than 24 ounces, which means 8 ounces of syrup and 16 ounces of water. Add to the mix a scant pinch of active dry yeast, cap tightly, and shake well to combine. Label and date the bottle. Allow it to get gassy at room temperature for 1 to 3 days until carbonated. The best way to test for carbonation is to create one small “testing” bottle of soda that should be checked daily for proper carbonation. 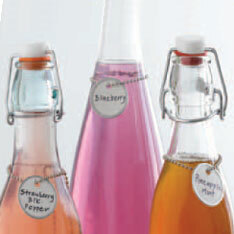 To do so, decant 1 to 2 ounces of your soda into a separate bottle, rescrewing the cap tightly after each check. Once the soda has achieved the right level of bubbles, move the bottle to the refrigerator and let the soda chill. Exceprts reprinted with permission from Can It, Bottle It, Smoke It And Other Kitchen Projects by Karen Solomon, copyright © 2011. Published by Ten Speed Press, a division of Random House, Inc. So far I’ve made kim chee, homemade butter (some other book), cheese sticks, miso daikon pickles, ricotta cheese (tonight), and all this goes along sweetly with my no knead homemade bread, so point? I luv your book. Both of ’em. Since I’m back on a ‘diet’ to lose some weight so I don’t enter my retirement life a non-moving lump which means its mostly home made meals, home made mayonnaise, etc. your books have come in quite handy. And fun to use.